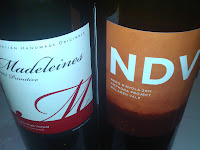 Angove have a knack of producing terrific wines which are very easy on the hip pocket. Quality that punches above the price point is always the hallmark of this South Australian producer and this wine is no exception. Under the guise of the Le Cirque Wine Co, this Duck Shoot Pinot Noir is the product of fruit sourced from the Yarra Valley. Although there are plenty of Pinots available under $20, many lack structure or varietal characteristics. This drop walks in at $16 rrp and covers all bases which makes it a stand out considering for the price point. A bright ruby colour with a slight dash of crimson, traits of a Pinot nose are clearly evident with stewed cherries, strawberries and a good whiff of forest floor. The palate is soft and smooth with a little rustic charm to keep it humming along. Oak is evident but certainly is not a dominant feature. Great length which was impressive too followed by a soft finish. Damn I enjoyed this! 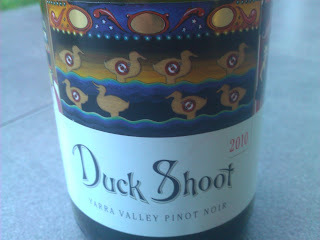 The label is hip and attractive, and just like the Duck Shoot at sideshow alley, "Step right up, step right up!" Bang for buck summarises this wine is beautifully!! Another extraordinary night of wines put together for this edition of Swirl Sniff Spit. Props to The Vinsomniac for his research and excellent presentations during the night, and also to Brad Hickey from Brash Higgins for making the effort to attend and share his wines. The evening showcased a delectable range of wines, many varieties of which have not been seen by most in the room - me included! In an industry where everyone is looking for a point of difference and a way to stand out from the pack, there were plenty of examples on show. 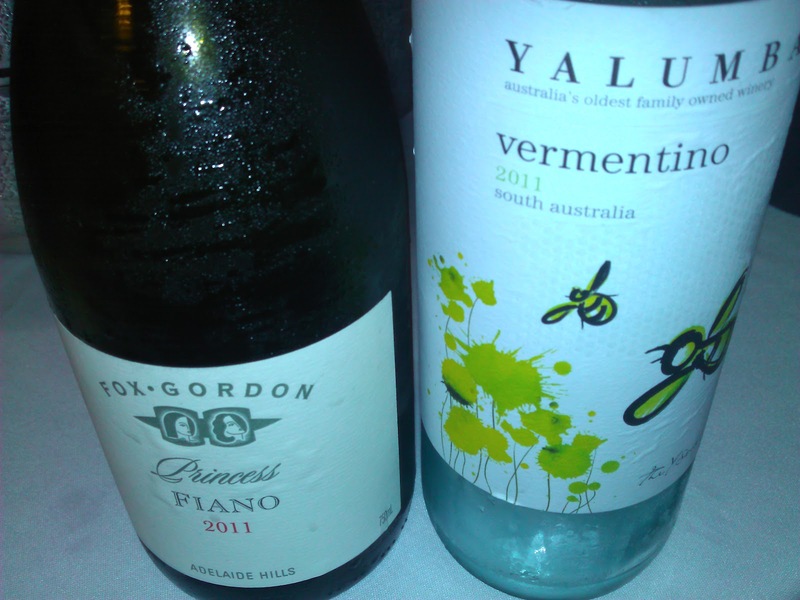 Fox Gordon Princess Fiano 2011, Adelaide Hills: Green pea/snap pea on nose. Grassy. Zesty. Love it, and represents super value for around $15. Check out my 2010 post here. Yalumba Y Series Vermentino 2011, Riverland: For a wine available readily for around $10, you'll be hard pressed to find quality like this at that price point. Serve super chilled with a bucket of seafood - ooh la la! Check out my previous post here. 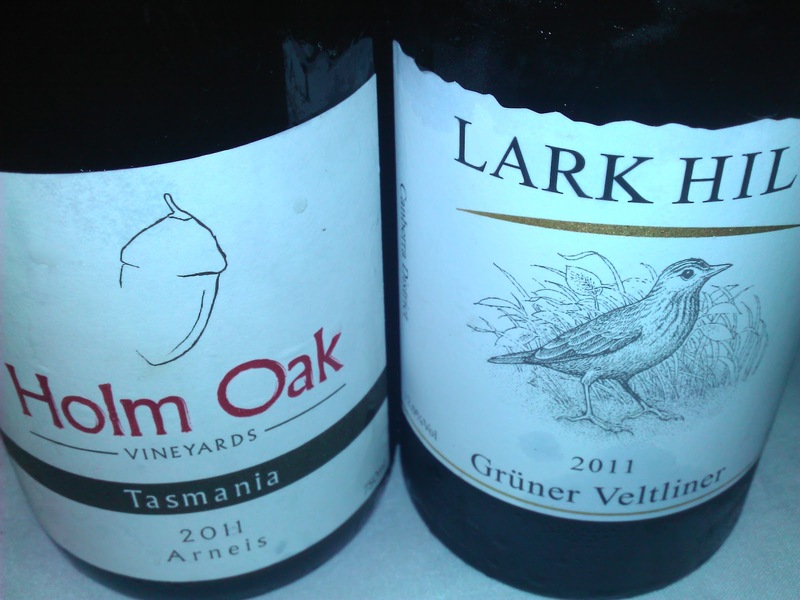 Holm Oak Wine Arneis 2011, Tasmania: Savory and peachy characters. Plenty of fans in the room enjoyed this but I found it a little too tart and acidic for my palate. Would go well with food, a creamy pasta or even fresh seafood. 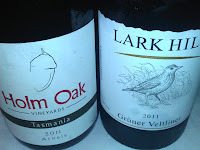 Lark Hill Winery Gruner Veltliner 2011, Canberra: This vintage has already sold out and the winemaker was kind enough to share this from his personal stash. A runaway early leader in the Wine of the Night for mine. Pear and fresh apple juice characters. This wine was fresh and finished with a tad of almond meal. A seriously good version of this Austrian variety. K1 by Hardy's Gruner Veltliner 2011, Adelaide Hills: Pears and pear skin. Restrained mid palate due to light fruit weight. A watery, clean finish. Many happy campers with this. Crittenden Wines II Tributo Savignin 2010: A sherberty nose. Flavours of savory herbs, spice and a crisp minerality and drying finish on the palate. Yum! 919 Wines Petit Manseng 2010, Riverland: Wow! This was a complex piece of work. Honey, spice, floral notes with a slash of apricot and stone fruit flavours. Lovely soft texture and super length. 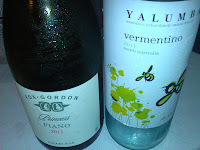 Only small quantities of Petit Manseng in Australia, four coming from South Australia's Riverland, and one each from north east Victoria and Griffith. Brash Higgins NDV Nero d'Avola 2011, McLaren Vale: On skins for two weeks. Wild fermented and only 114 cases made (less than 30 available as I write this). Lavender on nose - stunning!! Orange peel and raspberry jam flavours. Drinks like young Gamay. Serve with slight chill and drink now to five years. $37. Did I say how outrageously fantastic the nose was?!?! Madeline's Nangkita Primitivo 2008, McLaren Vale: Has an appearance of stewed plums in the glass. Cigar, fruit cake and spice characters all going on here. Gentle soft finish. 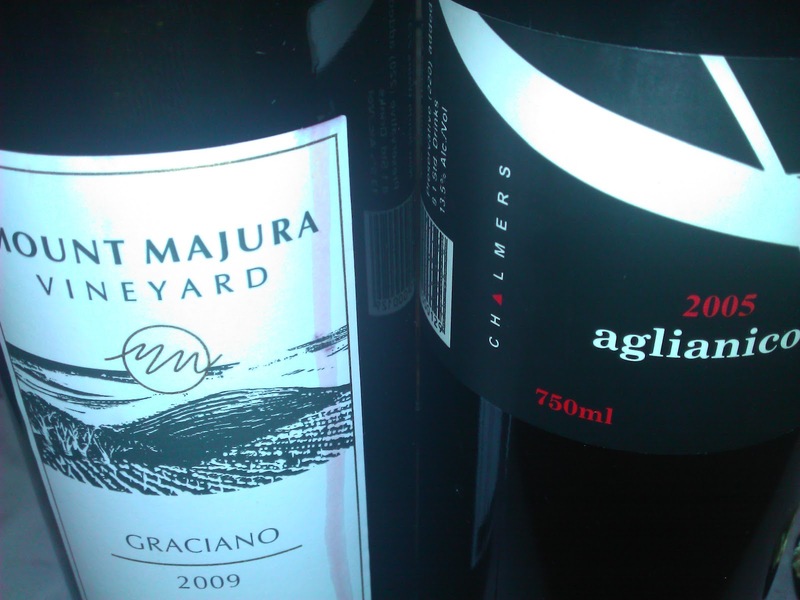 Mount Majura Graciano 2009, Canberra: Bright in the glass. Spice and cigar notes shining through. A fistful of pepper and balanced acid profile. Load this up with some food and you're happy. Chalmers Wines Aglianico 2005, Heathcote: Cherries, raspberries and earthy goodness. Some fruit cake elements in there too which I enjoyed. Smooth finish. An eye opener for a variety I looked at for the first time. 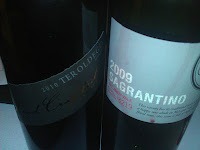 Hand Crafted by Geoff Hardy Teroldego 2010, Langhorne Creek: Rhubarb and raspberries leap from the glass along with wild flowers. Some serious kick here on the palate with a handful of dry herbs and flavours which follow through from the nose. The palate is also edged with a brush of pepper. Finish with a dry tannin grip. Matured in 4-7 oak for 18 months - I loved it! Wine of the night, hands down! Oliver's Taranga Sagrantino 2009, McLaren Vale: A great way to finish off the night with this heavy weight. This wine is the first vintage of Sangrantino made by the winery and it is a mighty fine effort. Violets, black fruits with a tiny herby touch, charred oak and a bucket load of tannin. A big chunk of pork will match perfectly. Coming in around the $20 mark, this is a well priced and very enjoyable GSM, which could easily fetch $30. The Pirate Cru portfolio oozes value and this is yet another example. 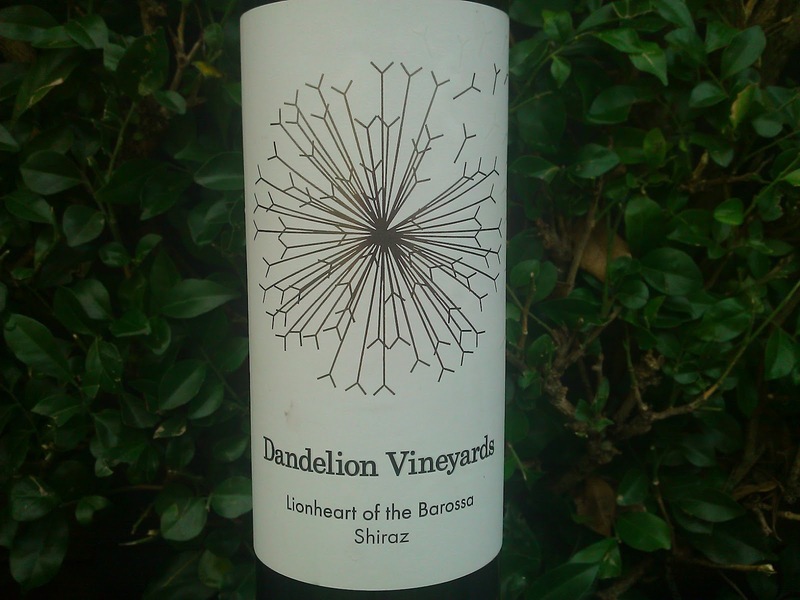 A blend of Grenache (42%), Shiraz (31%) and Mataro (27%), the fruit is sourced from dry grown vineyards in Vine Vale, a sub region in the mid-north of the Barossa. Dark appearance with a nose of black stewed fruit and chocolate. An inviting palate of earth and leather sitting behind a lovely tickle of spice. The wine brings with is a gentle warmth which calls out for hearty stews and casseroles. Aging in French and American oak for 12-18 months has added an edge to the wine, but the oak is not dominant. A soft finish with delicious length, drink now to five years. In short, bang for buck!! From Rhone comes this variety which is traditionally blended with Roussanne. 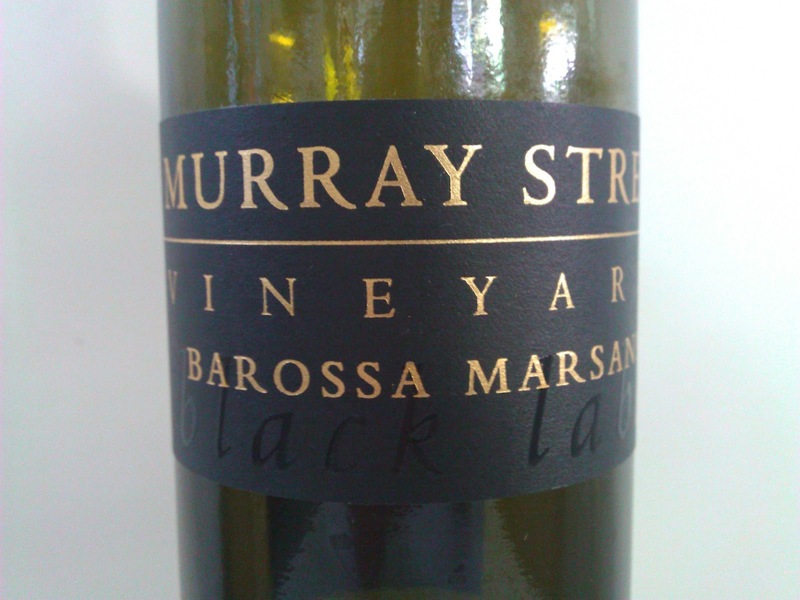 Marsanne has been grown in Australia for 150 years, and much of this is predominantly grown in Victoria. Amazingly, 80% of Marsanne in the world is grown in Australia! This wine comes from one of six wineries in the Barossa Valley growing Marsanne including Turkey Flat, Spinifex, Yalumba, Torbreck, and Steinborner Family wines. Tahbilk in Victoria's Nagambie Lakes region still is king of this variety in Australia with the largest planting of just over 38 hectares. 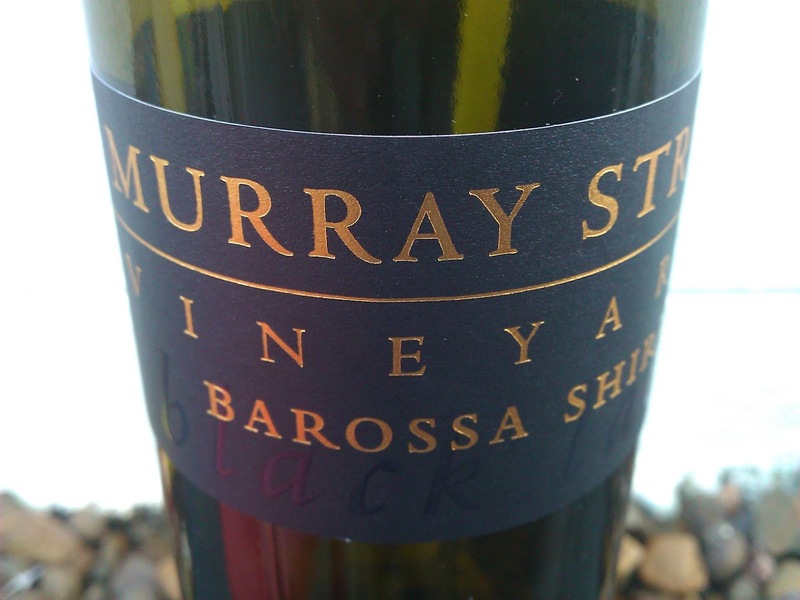 This example from Murray Street Vineyards entry level range Black Label, shows a nose of honey on toast. Distinct flavours of pear on the palate are prominent, a slither of almond, along with a cheeky spice. But what strikes me is the cleansing palate, not unlike a Riesling in some respects, showing a great acid profile which will lend itself to aging well. There is an oily texture on the palate too, also a trait of Marsanne as it ages. Being only a 2011 vintage, this is on the right track to develop beautifully. Enjoy with food - a delightful match with a baked prawn and leek risotto as I found out. A pretty impressive Pinot Noir right here! St Huberts from the Yarra Valley have recovered well from the devasting heat wave and smoke affected previous vintage to roll out this 2010 beauty. Whole bunches and a mix of new and season French oak has done the trick. Lovely bright colour. Savoury and earthy elements a plenty on the nose. Plump fruit which makes this wine very approachable and easy to drink. Some delicate cherry and slight stewed strawberry flavours on the palate. Having had St Huberts other Pinots in the past, this punches above its weight. The finish is a beautiful balance of length and tannin. For a mid $20 range Pinot Noir, give this a go. Drink now to three years. 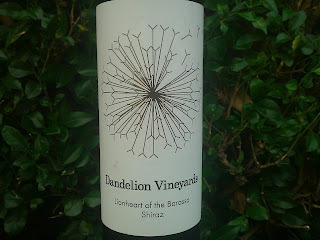 A little bit of a rustic Shiraz here which I really enjoyed. You can taste the hands and earth in the wine which is awesome. Whole bunch pressed, fermented over eight days, and then 18 months in 25% and older French oak. 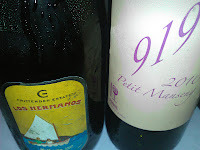 The bit I love is there was no fining or filtration, done deliberately to showcase the fruit and the vineyard. Wonderful aromas here of dark fruits and plums, cedery oak and vanilla. Hmmm! The palate is full of flavour packed with stewed berries, spice, pepper and a whisker of herbs. 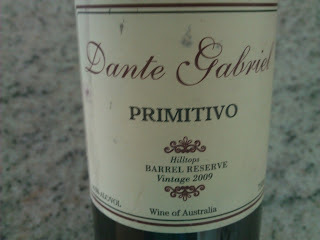 Plenty going on here but the fruit is well weighted and delivers nicely. There is a smidge of sweetness which adds another dimension which fits in well. A smooth finish of fine tannins and length on the palate cap off what I thought was a very good piece of work. Some of this vintage can still be located in bottleshops. Worth checking it out I say! 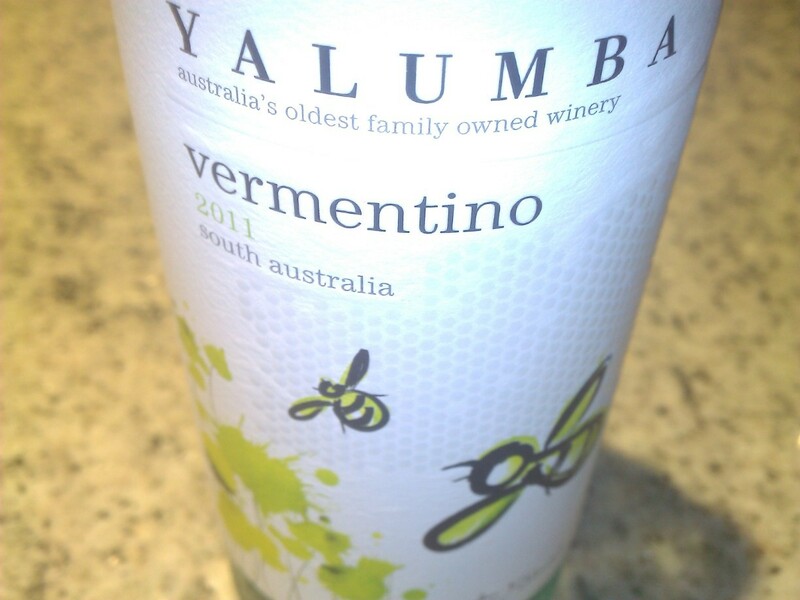 The Yalumba Y Series represents seriously good value and this Vermentino sticks to the winning formula. Super light in colour with a water like hue. The nose is loaded up with tropical fruit and melon along with citrus elements, specifically a sweet lemony curd/tart aroma. Simple flavours on the palate - clean and crisp. Not too heavy and drinking a bucket of the stuff wouldn't be difficult on a warm day served ice cold. Tropical flavours flow from the nose to palate with ease, with an added herbal twist, leaving you pondering the next mouthful. No need to wait for this one either - drink now. I'm often asked for alternatives to New Zealand Sauvignon Blanc. I'd highly recommend giving this a go for its easy approach and value. I've seen this regularly around the $10 mark, and for that, what a bargain!! Go on, give it a go - you've got nothing to lose! This is a mighty impressive piece of work by Pirate Cru Wines from single vineyard fruit in the Hilltops region, NSW. Shame for the punters is only 750 cases were produced and they are all sold out! Pirate Cru have an impressive portfolio and the thing that stands out is the quality across the board as well as the value. Some of their wines could easily fetch up to $40 off the shelf, the asking price for this piece and many others in the range is a mere $25. Whoa - this is a bargain deluxe! A gorgeous nose of violets greets you and lingers superbly coupled with lovely floral aromas. A gentle whiff of chocolate bullets also waft across. The palate is deep and rich assisted by twelve months in French oak. Plenty of plummy, dark fruit and dark cherry characteristics sealed up with soft and fine tannins and an impressive length. I sensed a little something extra was in there and some further investigation drew me to the conclusion that there was 10% Merlot and 5% Petit Verdot present. Most welcome additions which assist to deliver this well crafted wine. But in the end, I just can't keep my nose out of the glass - damn those violets are good! A new range of wines from Murray Street Vineyards with the focus here being on single vineyard and single variety. 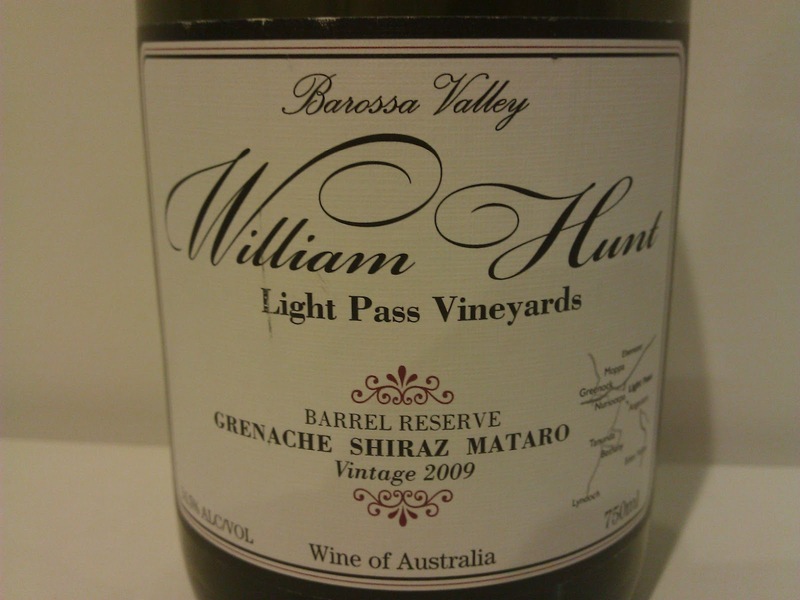 Typical Barossa oozes from the glass with lovely dark fruit consistent to the hue. All facets of this wine improved and developed as time went on. An earthy and leathery nose first up moving to a deep berry and funk - this has balance and groove all the way. Impressive fruit weight on the palate of dark plums, boysenberry and chocolate goodness wrapped up in a tidy present by some never ending delicious spice. This spice sits beautifully on the palate well beyond a minute. Lovely oak integration a result of 18 months in new and old French and American oak and I detect a tiny lick of sweetness from it. Soft and supple tannins - lip smacking goodness right here! For $25, this is a very well placed wine which will reward patience, but will equally reward the impatient.